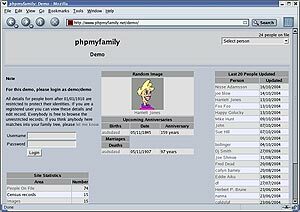 phpmyfamily is intended to allow geographically dispersed family members to maintain a central database of research which is readily accessable and editable. It allows family members to contribute as and when information becomes available without requiring them to send it to a central 'custodian.' At the same time, it allows the general public to view your tree (subject to the restrictions below) to see if they match.